is that 1.488v in bios or actual? Seems like 1.520 in the picture for me??? It's idling. At idle it's at 1.52/1.508 and load drops to 1.488. Not bad. I'm going to put on some arctic silver 5 when I get a chance and hopefully drop temps by roughly 5 degrees. Right now I have the Zalman junk on that I happened to find laying around. You're right SAJBAMA it is a lot of volts for air or anything for that matter... but oh well if it goes I had fun getting it to where it's at. And I now know the motherboard a lot better and how to pretty much do any tweaking with it. Going off track a little here, but thinking of getting a 4850x2/4870x2 sometime very soon... think the cpu would be a bottleneck? Just wondering, I'm not sure at what point the cpu starts to restrict performance. nice oc there. BTW high voltage damages cpus when not appropriately cooled. OP can expect that cpu to severely degrade on that cpu if its left at 1.48 volts without at least a peltier for 24/7 use. I use my E8500 at 1.42 volts on water, and thats pushing it IMO. But in the respect of the video card, the E8400 won't bottleneck much, especially above 4 GHz. 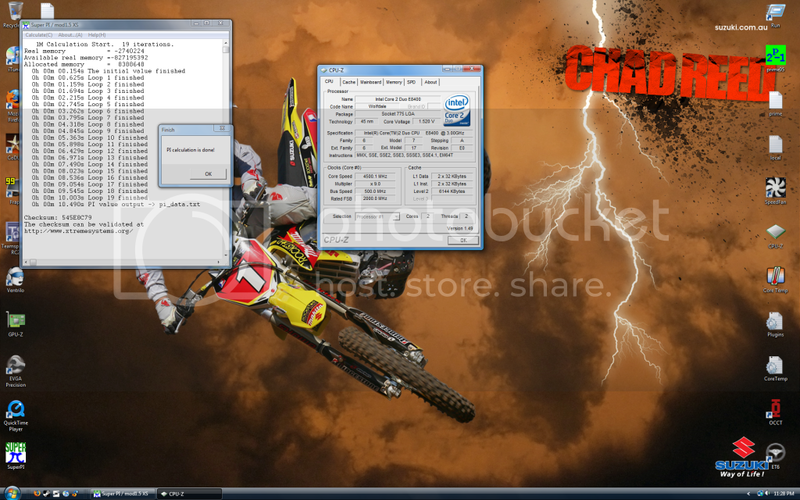 but in that logic then my Q9450 would step up to the plate and beat the stock clocked i7 lol. It's not news to me that high voltage is obviously not good for a cpu. I have read many forums and sites of people who run their E8400 (C0 and E0) at a mere 4ghz with my same voltage, with all of them using cheap air coolers and getting into the 70C range. And after a year these people have had no problems to speak of. In all honesty, I think in a year I will be upgrading the processor at a minimum. Also I have done research on water cooling systems compared to air cooling and I have found that most of the time you are needing to spend excess of $250 to get a cool running loop (basically just a good waterblock and a huge rad). I have seen that my air cooler runs about 10C hotter than the $300 water cooling loops. TBH, I don't even think 10C justifies spending over $100 on any cooling, never mind $250. The really cheap watercooling (like the swiftech kits with just a cpu block and a 120/240mm rad) run the same or hotter temps than my air cooler, and they cost about 10 times as much ($23 for the heatsink). So when it comes down to it unless I am going to watercool some video cards as well and really get into it, $250+ is money I don't want to spend and money I honestly don't have to simply cool the processor. And I haven't found a piece of evidence yet that shows high vcore and 65C temps equal dead chip. All the stories I hear of dead chips are from over volting the fsb, which mine is within spec.